Receiving Transactions are entered when you need to add shipments of items from your suppliers into your inventory stock. These items are added to your on-hand quantity and are immediately available to be issued out. Required fields are indicated by a red check box ( ). You can add up to five Receiving transactions at a time using the Clerk form. Click on the Receiving tab at the top of the screen. You can also click on the Receiving link in the Information & Analysis section of the home page. From the My Receivings list, click on the New Receiving (Clerk Form) link in the Shortcuts section at the top of the page. On this page, you can enter up to five receiving transactions at one time. The field headings in the bar at the top correspond to the entry fields in the columns below. Select the Inventory Type of the item from the drop down list. Type the Item Number into the field or click on the binoculars icon to open a pop-up window where you can search for and select the item. Select the Pool from the drop down list. Enter the Quantity of the item you are receiving. Update the Unit Cost of the item if necessary. Click Save at the bottom of the page to save the transactions. Click on the Receiving tab at the top of the screen. You can also click on the Receiving link in the Transactions section of the home page. From the My Receiving list, click on the + Add New Receivings link on the right side of the list. If you entered a Supplier Item ID and Supplier information to the Inventory Item detail page, they will populate for you. Select the Pool where the inventory will be stored from the drop down list. The only pools that will be available to select from are the ones where this item is currently stocked. You will also see the on-hand quantity for this item beside each pool name. Select the Budget Code if needed. 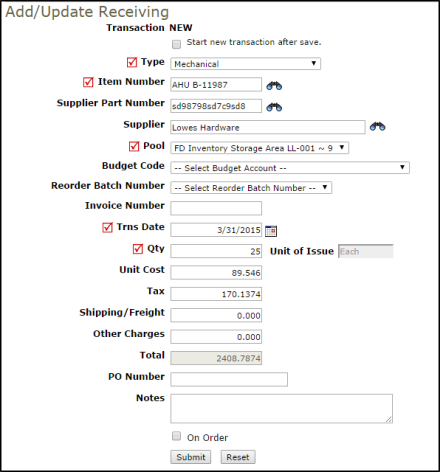 Select the Reorder Batch Number if this shipment was entered as an order through InventoryEdge. Enter the Invoice Number for the shipment. Enter the Quantity of the item you are receiving. The Unit of Issue will populate for you. *Note: Remember to enter the quantity amount as you plan to issue it, not as you received it. For example you may have received 2 cases of paper towels containing a total of 24 rolls. If you plan to issue them by the roll, you will need to enter 24 as the quantity. If the item received is set to use the Fixed Unit Cost, the system will populate the Unit Cost field for you. You can update that field if the cost has changed and check the box to Update Fixed Unit Cost. This will update the cost of the items already in the system to the new fixed cost. If the item received is set to use the Avg Unit Cost, the system will populate the unit cost of the items already in stock. You can update this in the Unit Cost field if the cost has changed. The system will then average this new cost with the existing cost and assign a new cost for all of the items. Enter Tax, Shipping/Freight, and Other Charges as needed. Enter the PO Number for the shipment. If the item is currently On Order, put a check mark in the box.